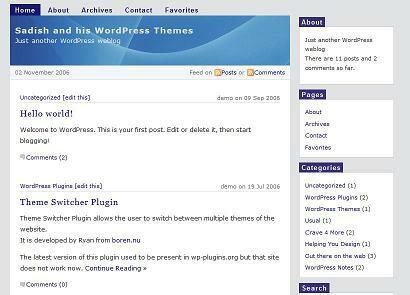 AquaBlue is another wordpress theme, that we are proudly adding to our collection of themes. Its a two-column,Fixed-Width, Widget-Ready wordpress 2.0 theme. It has many more features in the theme, that you can explore once you downloaded the theme. This is a very nice theme. I like the blue shaded colors. Thanks a lot! I’ll use this one at my new blog that i’ll lunch next month. It’s simple superb! I am currently using the AquaBlue theme on my wordpress blog. Great theme, thanks! I have unfortunately noticed one little nag; When using the widget sidebar, I can not use the akismet widget. The akismet plugin doesn’t show up the right way in the sidebar. I have tried this in several other themes, with no problemes. But in the AquaBlue and AquaGreen theme it doesn’t work correctly. In the AquaFluid theme it works just fine. Is there a way to fix this? open up your footer.php and look for <?php wp_footer(); ?> before the closing tag of body. if it is not there, then add it. if it is there and you are still having issues, let me know. I modified the footer.php as you described. But it didn’t solve my problem with the akismet plugin. Sorry! Any other suggestions? I think the plugin actually displays the number of comments, but it is just not able to load the background image, so that the text becomes visible. I dont have a clue on this, it is better answered by the plugin authors. Nice theme, I have it running in my blog. I just have one problem, though. Do I need a plugin for the page to show properly or something else? Thanks for this wonderful theme. Plain and simple. Exactly what I wanted.